Raise your hand if you have at least one plant in your garden with roots in garden blogging. In my own garden, I recently purchased and planted three perennials that I would not have found out about if it were not for garden blogging. 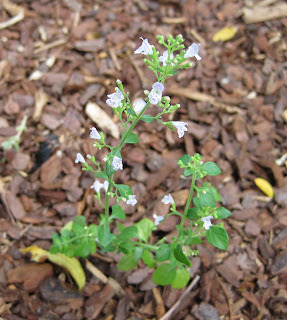 The first one, pictured here is calamint, Calamintha nepeta supsp. nepeta, which I first saw as a nicely rounded plant, not yet in bloom, growing in the Lurie Garden at Millennium Park. I visited that garden this spring with other garden bloggers attending the Chicago Spring Fling. My calamint is just a wee tiny little plant right now but I look forward to the summer when it is a nicely rounded shape without having to prune it. I also planted the Oxford Orphanage Plant, Kalimeris pinnatifida ‘Hortensis’, also called the Double Flowering Japanese Aster. Why did I seek out this plant for my garden? Because I read a post by Allen Bush on the Human Flower Project blog/website about how the garden designer/writer Elizabeth Lawrence gave him a start of this plant as a passalong plant when he visited her garden in 1982. That’s a good reason! Finally, I planted Salvia ‘Rhapsody in Blue’ because of all the Salvia blooming in the Lurie Garden this spring. It’s not one of the varieties they had planted, but it was one that the nursery that I ordered the other plants from had so I got it. Still on order are some spring flowering bulbs that I saw blooming at the Chicago Spring Fling, including Quamash, Camassia leichtlinii ‘Blue Danube’, and more ornamental onions, Allium. They should arrive with some other bulbs for species tulips and all kinds of bulbs for indoor forcing that I read about on Elizabeth L’s, blog, Gardening While Intoxicated. And if there is still time this fall, I'd like to find some of those new Igloo Mums that the Hoosier Gardener wrote about. Previously, I've purchased spider type daylilies after reading about them on Red Dirt Ramblings and Clematis ‘Rooguchi’ which I found out about via a bloom day post from Blackswamp Girl and had to have for my garden. In fact, most Garden Bloggers’ Bloom Days when I read all the posts of what’s growing in everyone’s gardens, I end up noting one or two or more flowers that I want to grow in my garden. Some I end up planting, others I don’t. Those that I do plant will be forever linked to garden blogging and garden bloggers as blogalongs*, in much the same way that flowers passed along to me by other gardeners are forever linked to them as passalongs. Does anyone else have any blogalongs in their gardens? 1. Noun., plants discovered by reading garden blogs. That's a good term to coin. What about if you read about them on a garden blog, and they're on your list, but you haven't actually got them yet? I think anyone who is a regular garden blog reader has at least one blogalong. I have a couple, 2 of which, Aster oblongifolius 'October Skies' and Corylus avellana 'Red Majestic,' I saw on Nan Ondra's Hayefield House blog. I think almost my entire garden now consists of blogalong passalongs...especially from Annie in Austin and Pam/Digging. The scarier statistic is the number of plants they've both graciously shared that I've already killed and am ashamed to tell them about Is there a term for that? Yipes! I forgot to add, of course, the packet of white marigold seeds you sent me. Two plants have managed to survive the summer--they may bloom yet! I have a large number of blogalong passalongs because I am fortunate to live close to Mr. McGregor's Daughter! Thanks to her I have prairie dropseed, nodding wild onion, wild petunia, woodland phlox, a toad lily, another daylily, some little bluestem and wild ginger. Have have a few blogalong-passalongs from Frances and Gail. Frances passed along a very nice red daylily and Gail gave me several things like her PPPP. As for blogalong plants, there are just too many to name! The danger of garden blogging is seeing too much that you want to add to the garden. I have too many to list all the blogalong passalongs from my fellow Austin garden bloggers, which pleases me no end. Plus I've gotten some seeds and small starts from garden bloggers from out of state, which is cool. Perhaps I'd never have gotten interested in agaves, which I'm now mad about, if I hadn't read about them on Tom Spencer's blog Soul of the Garden. And then there are all the garden design ideas I've picked up from reading garden blogs. I think blogalongs are one of the great pleasures of having garden blogging friends.It's great to get recommendations from friends and not just the people whose business it is to sell plants. Always enjoy your posts. I have a plant "wish list" which consists entirely of plants I've read about on other blogs! I've been bad about updating it in a while, but I actually have either purchased or received several of those on the list. I've gotten quite a few passalongs from Beckie, of course, but also cinnamon fern starts from Lisa, which must be blogalong passalongs. A new baptisia, because of the visit to the Lurie Garden, "Limelight" hydrangea because of bloggers like Joy and Racquel, black-eyed Susans because of Gail, orange cosmo seeds from Tina... Heavens, I think half my garden is due to blogging!! And, I haven't even planted any alliums yet, which, of course, every Spring Flinger is no doubt planting this fall. Luffa. I never would've known what they were if it hadn't been for garden bloggers. Not really, but only because I read a lot of blogs from people in different climatic zones and with different soils. What I do pick up is ideas for colour schemes and so forth. I am currently planning to pot up some of my neglected aloe vera in an attractive way, and that's the fault of Pam from Digging! Yes I have some too!! It's great isn't it? My hand's up, too. I have several new additions this year, thanks to local bloggers who share their pics. I also save posts in my feed reader that mention plants I want to try. Although the Divas of the Dirt had already shared plants & influenced my choices before blogs did it, once I read & then met MSS of Zanthan & Pam/Digging they're responsible for a lot of Passalong-Blogalongs including the now-blooming Oxblood Lilies. Reading made me buy some Blogalongs, too - had to have a Meyer Lemon like the one at Zanthan Gardens, Pam's fragrant mistflower & Belinda's Dream rose made me want to have one! Since you're so good at making up names, Carol - what's the term for lusting after an unattainable plant seen on blogs - one you could never grow in your own garden for reasons of climate? Mr McGregor's Daughter and Pam in South Carolina taunt me with those! I've got several Agaves now because of Pam at Digging ... I realized they'd make great low-maintenance container plants for a sunny patio. I know there are more, just can't remember what right now. I do know my list of "wishIcouldgrowthats" is a lot longer thanks to all you bloggers in cooler climates! Tis true, many plants now reside in my garden from viewing and reading on other blogs of them... thanks to all for uplifting my garden! I feel left out! How can this be? I have no plant that is the result of reading blogs. I'm not sure why, but the fact remains. In fact, as I read your comments I wonder where I have gone wrong. How can this be? H.
Oh yes, I have some Blogalongs. They are such fun to have not only because they are great tried and true plants but because I know where they came from. Such a great writer invents useful words.